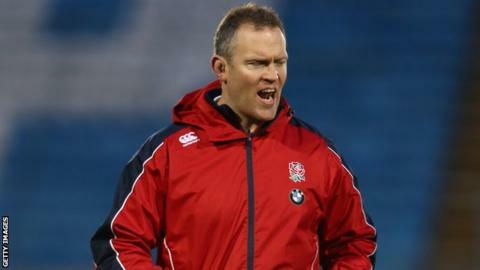 Exeter Chiefs have appointed England Under-20s head coach Rob Hunter as their forwards coach. Hunter will take on the role after the Under-20s Six Nations finishes in March after three seasons with England. "I felt that the time was right to move on and I'm looking forward to having that day-to-day interaction with players," Hunter said. "They've put together a good side, they have great home support and it's a fantastic opportunity." Exeter head coach Rob Baxter has taken control of the club's forwards in the past few seasons, with assistant coach Aly Hepher in charge of the backs along with skills coach Ricky Pellow. Chiefs have five players in the current England Under-20s team, while a sixth, Jack Nowell, has not joined up with the national team as he has been involved in Premiership and LV= Cup action. "Not only do they [Exeter] have a great culture within, but the ambition of the club is huge," added Hunter. "The club is looking to develop their ground and move forward on that front, but equally the coaches and players are hugely ambitious and they have assembled a quality squad with fantastic supporters."